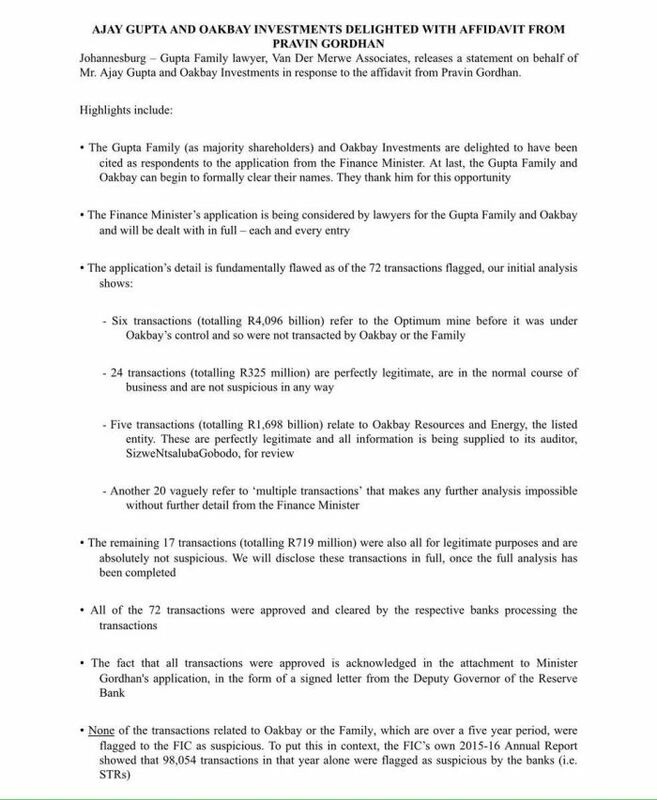 Oakbay Investments say they are 'delighted' to be respondents in the Finance Minister Pravin Gordhan's court papers so that they can begin to clear their names. Gordhan's affidavit revealed that R6.8 billion made in payments by Gupta brothers and firms they control have been reported to authorities as suspicious over the past four years. Yesterday, Oakbay Investments chief executive officer, Nazeem Howa, resigned with immediate effect due to health issues. Gordhan's affidavit also revealed that he had discussions with Howa over the bank account closures. Sunday Times reported that the affidavit submitted by Finance Minister to the court reveals Gordhan had had discussions with Howa.